Many of you know that I lost Norma (The Best Cow Ever) last week. I have truly appreciated all the kind words that you have shared with me on facebook, twitter and other ways. There have also been many questions about why Norma died and what exactly happened. Norma would be disappointed in me if I didn’t share her story with you. This is Norma the day I bought her. April 23rd 2010. I am a cow auction addict. I love going to cattle sales and it’s even better when I actually get to buy something. In April of 2010 I was still working full time on my in-law’s dairy farm and didn’t have a clue that things were about to change drastically in a few short months. My birthday was coming up and it just so happened that the local sale barn was having a cattle sale. My father-in-law came down as well, little did I know that he and my husband had already discussed buying me a calf as a birthday present. We got there a little before the auction and I fell in love with …. This calf caught my eye and I was just hoping that I would have enough cash to buy her when I walked into the barn to check out the cows. Towards the end of the barn, the cow that would really change my path in life was standing there. As soon as I saw Norma I had to get my father-in-law so he could see her. I had never seen anything like her and I had no idea what breed or breeds of cow she was. In fact I am fairly certain I had never even heard of the Normande breed of cattle. Never in a million years did I expect that at the end of the sale both Norma and her calf, the one I fell in love with first, would be coming home with me. Somehow without ever even letting me see that he was bidding my father-in-law bought both Norma and Nermal and I was over the moon when I figured it out. At first Norma wouldn’t even let me touch her. After much persistence on my part and a lot of patience she finally decided I wasn’t too bad after all. Although I will say that her personality wasn’t exactly as loving towards me as I was towards her. Usually in her presence I was merely tolerated because I scratched the places she couldn’t reach very well. She also quickly won our hearts over in the milking parlor too. Norma was a very good producer, especially for her size and her butterfat and protein levels were the highest in the herd. A few months later after a family civil war Pat and I were no longer on the farm and it broke my heart to leave Norma behind. After a while I was able to find a herd that had a little extra space and I went and took out a loan from the bank to buy Norma from my inlaws and was able to move her somewhere where I could see her. Eventually she moved to the farm across the road from us, where all of our heifers and cows are and I got to see her all the time. Norma continued on, being a rock star and gave me another daughter in March of 2011. Then in her next lactation she had problems getting pregnant again. Most cows that would have had so many breeding and still not gotten pregnant would of had to be culled (sold) from the herd because a cow will decrease the amount of milk she gives greatly the further she goes from having a calf until she dries up completely. However since Norma was a special cow we kept trying and thankfully, she finally got pregnant. This August, Norma had Ned. In August Norma gave me a bull calf and I will admit, I was disappointed to not have another daughter from her to carry on her line. A while after Norma calved she started to show signs that she wasn’t doing well. We had the vet out for her and judging from the symptoms we made the decision to do a surgery on her to fix a twisted stomach, a fairly routine surgery for a dairy cow. We weren’t positive that she had the twisted stomach but since she was Norma and she was special the chance that it was twisted and she would get very sick from not fixing it we decided to cover our bases and do the surgery. The thing was, when we got in there we realized that her stomach wasn’t actually twisted. Severe indigestion was causing the symptoms that mimicked a twisted stomach. It turns out that Norma’s skin was just as brindled as her hair. We shaved the hair off of her side before the surgery so that the site was as sterile as possible. After the surgery Norma seemed fine. She went back to being her usual self and even stared in my first video blog. Things were back to normal with her until just about 2 weeks ago. Norma came into heat and we bred her, in fact, she stared again in the post I did about it. But Kevin, our herdsman mentioned to me that she wasn’t giving as much milk as she normally did the day after she was in heat. Not a huge worry, often cows that are in heat are so crazy in love with everything they forget to eat for a day and milk production goes down during the hangover of lust and love. But with Norma, a week later she still wasn’t going back up on milk and now she didn’t want to eat and had very loose manure. These things are not signs of a healthy happy cow. We called our vet out and we started to try and figure out what exactly was making Norma sick. We were able to rule out the usual suspects, it wasn’t mastitis, it wasn’t pneumonia, it wasn’t a twisted stomach, it wasn’t this or that or any of things on the list that have easy or even difficult fixes. We just couldn’t tell what was causing the problem. So we pumped her stomach with water and alfalfa meal to keep her hydrated and to try to stimulate her appetite. We took blood to test her levels and checked her for some cow diseases and started her on some cow sized Tums. I figured she would bounce back, she was after all Norma The Best Cow Ever. There was just no way that something as silly as a tummy bug was going to take her from me. Very early the next morning I boarded my plane bound for Kansas and the Small Town #140Conf social media conference that I was speaking at. When I turned my phone on after touching down in Wichita I had text messages and voice mails from the farm that I never expected. Norma had “gone down” in the parlor while being milked. When a cow is to weak to stand she will lay down and not want to get back up. This is a major problem. By the time I got the messages the vet was pulling into the driveway to try and help her. I talked with her and she let me know that the blood work they had done showed some very troubling numbers. Norma’s white blood cell count was very low, her liver levels were also very low and her electrolyte balance was crazy out of whack. This information didn’t tell us what was wrong with her but it did tell us that the prognosis was very poor. I asked the vet to do whatever she possibly could do to save my cow, I got in my rental car and balled my eyes out. The vet threw everything that she had at her hoping that something would “fix” her for me. My husband went at night after work and worked on her more. But she just wasn’t getting better. I asked him to send my photos so that I could see her for myself. I still had hope that she would rebound and that I wouldn’t loose my Norma. After I saw the photos my prayers that she would get better changed, instead I prayed that she would just hang on until I could get home and hug her neck and tell her how much she meant to me before she left. Totally selfish of me, to know that she was sick but want her to hang on anyways, but not being there for her was killing me inside and I was selfish. The next morning m husband checked her before work and she was still hanging on. I told him to hug her for me and tell her that she had to get better. He had taken her temperature and it was hardly above 95, he thought the thermometer was broke but I knew she was leaving. I still had to go forward with the plans that had brought me to Kansas and went to the appointment I had that morning. All during the appointment I could feel my phone vibrate in my pocket. I knew why but I had to keep it together through the appointment. I got to the rental car and called home knowing she was gone. We buried her on our farm. I can see where she lays from the windows in the kitchen. Eventually the plan for this area is for it to be an orchard although right now it only has two scraggly plum trees. Ashes to ashes, her body will feed the trees that will one day provide fruit for us. The circle of life goes on. But for me I will always have a little piece of my heart dedicated to her. There can never be another Norma. 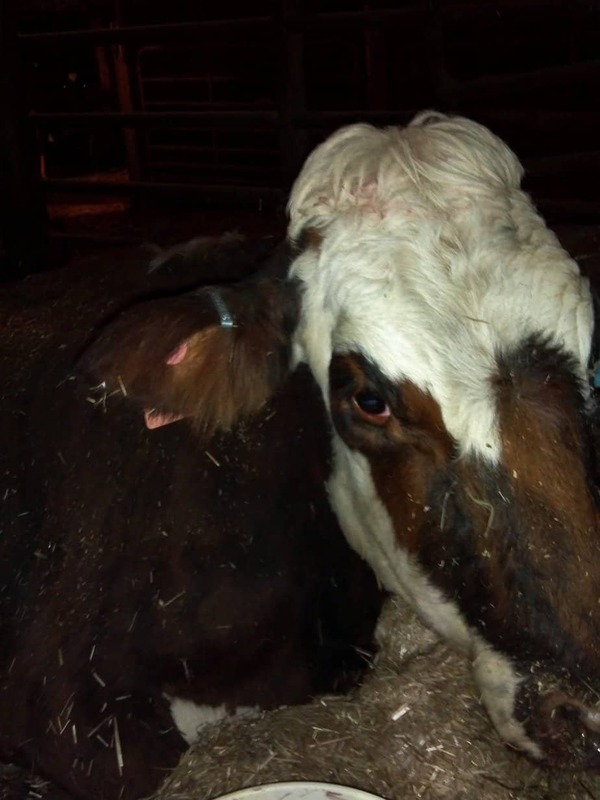 Not just because a cow that special doesn’t happen often, a dairy farm can’t sustain a whole herd of pets and ultimately that’s what Norma was. As much as I love all of my cows the extreme lengths and expense we went to because Norma was a special cow, not just during her final sickness but also in keeping her even after she had been open for so long can’t happen with every cow. We treat all of our cows with compassion, respect and love but to be honest if she wasn’t special Norma’s story would be different because it would have had to be different. Norma wasn’t a young cow, my best guess at her age would be 6-8 years old. She could have lived longer but it wasn’t in the cards. 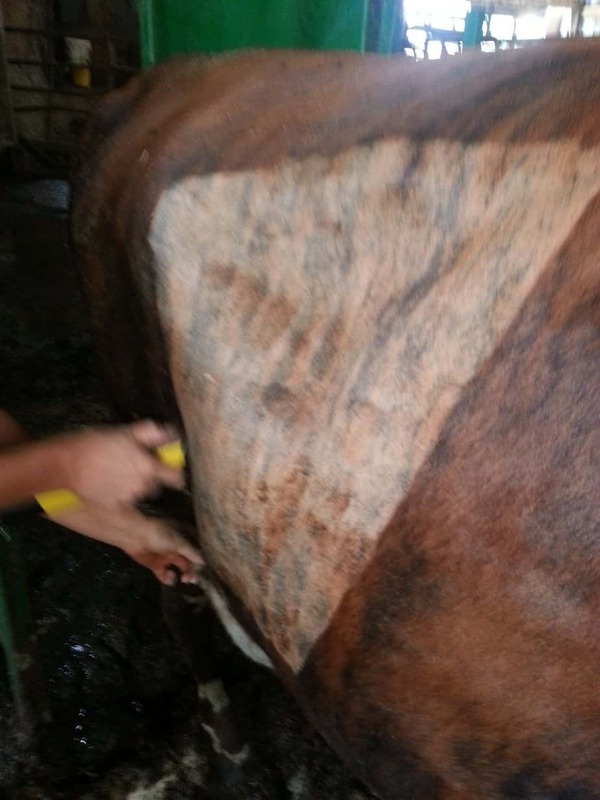 The blood work that was drawn while Norma was still alive came back and showed that she was positive for Johne’s disease as well as Bovine Leukosis. Both of these diseases are contagious through various forms, Norma probably had them when I bought her. One of the problems with buying cows from auctions is that you don’t know where they came form and what diseases they could possibly have. We will manage her daughters as thought they are positive for them as well and do what we can to halt the spread to their future daughters and other cows and calves. Both of these diseases are ultimately fatal. It wouldn’t of mattered what we did to try and save her, Norma wasn’t going to be able to be saved. I am very thankful that Norma came into my life. 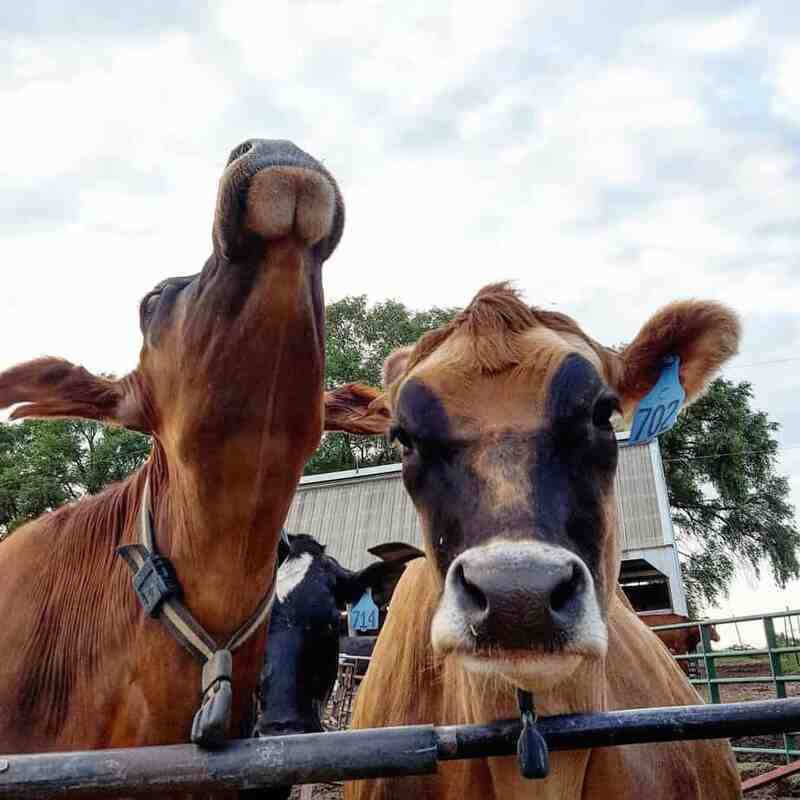 Not only did she allow me to learn so much about cows, sharing her life as a dairy cow on our farm bit by bit here on my blog allowed me to share the story of dairy farming and I think that alone make her special. ****************Updated to add… This story has got to be one of the sweetest things I have ever experienced and I wanted to share with you Norma II. 49 Comments on Norma’s Story. Somewhere in last week’s craziness, I missed that Norma had left us. I am so sorry to hear about this. I loved this piece and wish that all the crazies out there who think we farmers “hold our animals hostage” and “torture them could read this. Hoping Fluffy Ann will fill some of the emptiness in your heart. And Marilyn is a STAR!!!! My heart just aches for you. As you said, we respect and care for all of them, but sometimes some are special above and beyond all that. And that’s why Johnes is such an awful disease. Incurable, and it will kill them. We have it in our dairy cow herd, but with good management we’re down to just a handful of carriers in a 200 cow herd. When they go clinical (suddenly liquid manure, eating but still loosing weight/milk production), nothing to do but let her go. I’ve even lost a goat to it. Crossing my fingers they’ll have a vaccine against it soon. So sorry you lost her, she was an awesome cow. The daughters & the new girl will never replace her, of course, but hope they fill your heart with their own special happiness to help you through missin Norma. Beautiful….just beautiful story. It touched my heart to read it. My heart breaks for your loss as we have all felt love for our ladies who share our lives as dairy farmers. Norma was gorgeous and will be a beautiful cow angel, who will no doubt be watching over you. Thanks for sharing, Carrie! Norma will be missed. Looking forward to the future adventures of Norma & Marilyn. I certainly knew of Norma and have followed various Facebook and blog posts about her, but thank you for sharing her whole story of how you ended up with her again. My heart was breaking for you last week. Your strength and the story you shared at the State of Now #140 Conference was amazing- Norma would have been proud. You were certainly blessed to have Norma. We were blessed share her with you. I do remember your post and my comment. Thank you Jodi for being there for me last week. I really appreciated having someone who gets it there to give me a hug when I needed it. Jodi is the best at giving hugs and being understanding. True story. I mentioned to David this weekend that it was pretty cool how you got Marilyn so quickly after losing Norma. I love when life works out like that. Love your story of Norma. I am s dairy farmer thru marriage. We have about 52 cows in milk. We were a closed herd until about 2009. We had all registered Holstein, but now have some cross breeds, jerseys and one Brown Swiss that my daughter(4 years) picked at a dairy auction. She (Dolly) had been bred to an Angus and calved on the fifth of July while we were all in the U.P. for vacation. Monkey is quite a character and her momma is a steady milker and easy to deal with in the herd. We AI bred her to a Brown Swiss and will be preg checking her this Friday. I’ll keep u posted. Carrie, I’m sitting at my desk balling. I never met Norma — I could have, I should have, but college always seemed so much busier than it really was and I was paranoid about money. I’m sorry for that. More, though, I’m sorry for your loss. These things are hard. And we know, theoretically, we shouldn’t get attached to the animals. But, there are always those ones who leave a mark on us. I’ve nursed a broken heart over the loss of rabbits and farm cats. It’s tough, but at least we know that when they were with us, they had good meaningful lives. Norma was a great cow. She was lucky to have you, and now she’s in the great big pasture in the sky. Here’s hoping to many years of health and productivity to Marilyn, as well as Norma’s girls Nermal and Nora! You’re in my thoughts and prayers, Carrie. Beautiful story Carrie. It reflects what is great about growing up/living on a farm. Learning the circle of life is critical to our development, as well as understanding when it is time to let go. Sometimes life just isn’t fair. Thanks for sharing. Thanks for sharing, Carrie. What a beautiful story. Glad myself, #2503 and Redondo cooperated and gave you a heifer calf. I am very thankful for that to and thank you again for parting with Marilyn. It’s Thanksgiving month and I’m thankful for dairy good friends who care about their cows and friends. Long live, Marilyn! I hope you toasted her life with a glass of Rumchata! I’m so sorry, Carrie. Having lost a few number of special moos myself, I understand the depth of your pain. I’ll toast Norma from afar over the next glass of wine. I feel for you, Johne’s is a horrible, horrible disease. My family’s herd first got it in the 80’s and we’ve been fighting it since then, finally have it under control now, with only a clinical case every few years. Most cows who get it will break with those symptoms you described when they’re only 3-years old. The fact that Norma made it until she was much older than most cows that get it is a testament to you providing her with a very low stress life, as well as demonstrating that she was tougher and more determined than the average cow! Carrie, I have followed you and Norma with great joy. I am so sorry ypu lost her. Carrie.. another good post about Norma! So sorry that you had to lose her 🙁 She will live on forever in your heart and memories! Something about certain cows that just make them special! Farmers farm with their hearts into all they do, even when the outcome doesn’t go as we wish! God bless you and your herd.. we know Norma is keeping an eye on things from greener pastures! SO sorry to hear about Norma. I grew up on a dairy farm and had those very “Special” pets… we kept them much longer than they were productive because we loved them so. My “Penny” lived for 13 years and blessed me with 12 heifer calves (a couple sets of twins in there). So sad when she passed. I don’t live on the farm any longer, but am involved with animal husbandry still! I breed Bombay cats! And it’s equally troubling to lose one of these babies. It never gets easier. Love to read your stories. There will always be one that sticks out, and when they leave they take a piece of our hearts with them. I am glad you and Norma met and shared that special bond. Ahhhh just read the tribute to Norma from Kansas mom’s boys!! I agree so sweet! This brought tears to my eyes. As someone further up said, I wish the crazies who think we torture animals could see this (we’re dealing with the Ban Live Export ones again in Australia). They just don’t get the love and attention that goes into our animals, especially the special ones. What a great tribute to Norma. Sorry to hear that you lost her and it seems like she really had a great life with you. Her story reminds me a bit of our first Red Holstein heifers, Scarlett and Freckles. 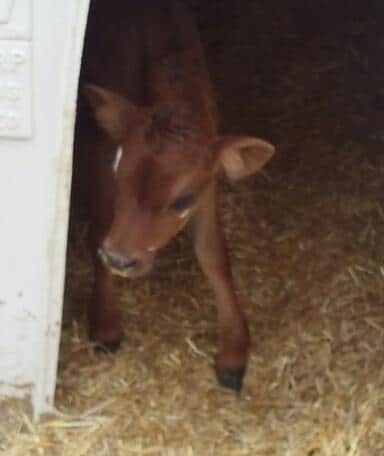 They were my pets, Scarlett because I nursed her legs to strength when she couldn’t stand well as a calf, and Freckles because she was red and very friendly. 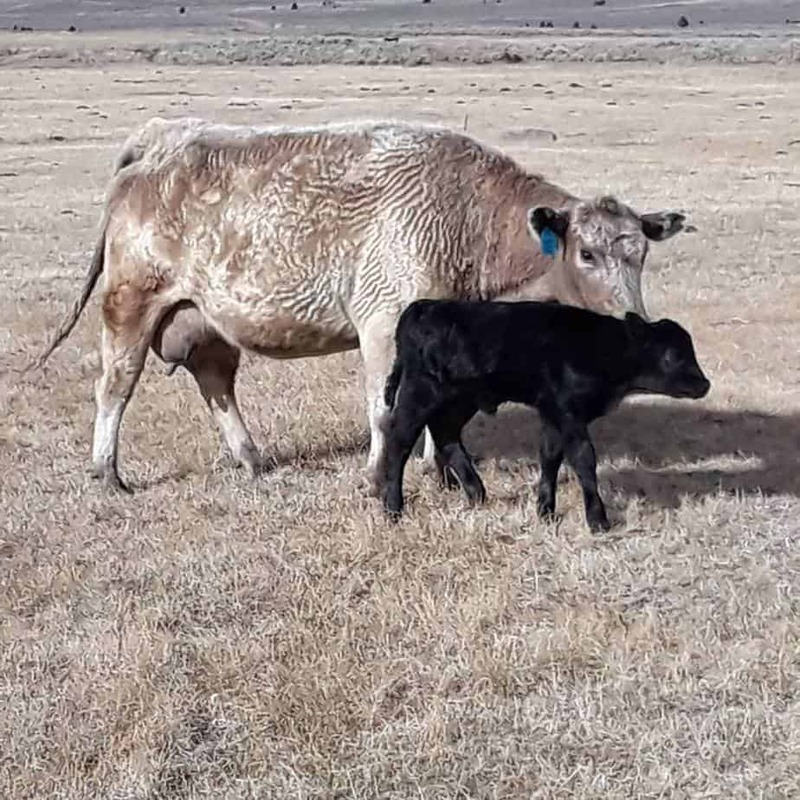 After her 3rd calf (all bulls), we just couldn’t get Freckles bred back despite more tries than we normally would do and I was so sad when we had to cull her. Carrie, no cow will ever truly fill Norma’s shoes for you. Having been your first, she will always hold a very special place in your heart. Thanks for sharing her story with us! Her legacy will live on through her off spring and your continued work with the Normande Breed. Maybe you just figured out part of your “line” name…as an honor to your dairy roots. I’m sorry you lost Norma, growing up on a dairy farm, I can definitely relate. Your story made me cry because it reminded me of my show cow Pam, she had a similar drawn out end, where we just kept hoping she’d come back. 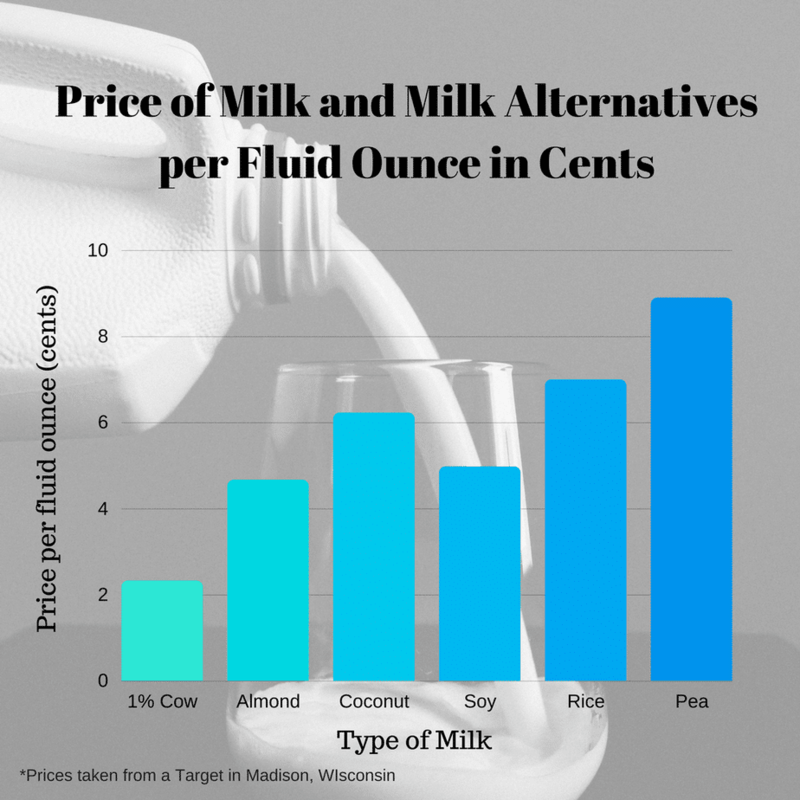 Thank you for sharing your story, and for educating people about the dairy industry. Aw, so sad! It never gets easier, does it? Thank you so much for telling us Norma’s story. I first learned of Norma when she was Shirley’s running mate. She truly was the best cow ever. Carrie – my heart hurts for you! I know this must be one of the hardest things you’ve ever had to do, but I think it really just goes to prove how much farmers truly care for our animals. They aren’t all our favorites, but they are all important. I hope Marilyn brings you and much happiness as Norma did! Thank you Carrie for your true and honest words. I pray a blessing for your family and your herd. This brought tears to my eyes. I am no stranger to loosing cows or other animals. 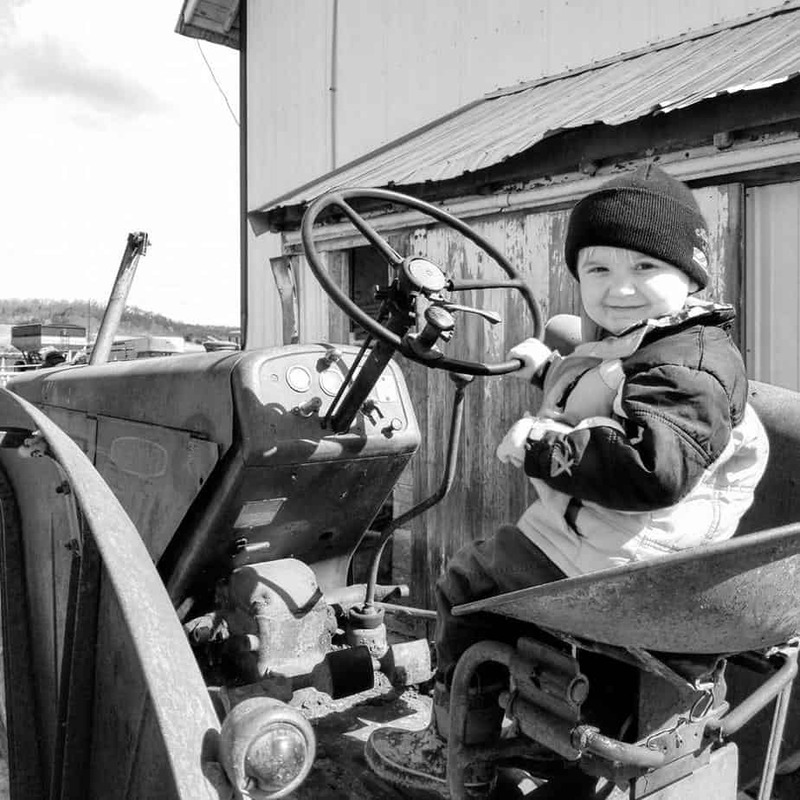 Growing up on a farm, you realize it is a fact of life. One cow that left an especially large mark on my heart was one of my first calves I bought when I joined 4-H at age 8. 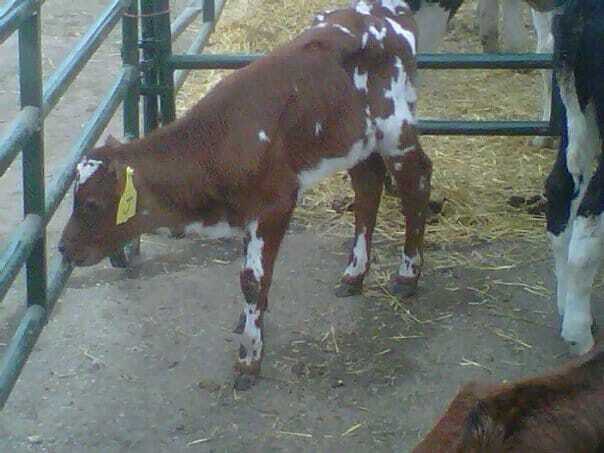 I won an essay contest that got me $500 towards the purchase of a Guernsey calf. I picked her out and named her Ramona. She was by far my favorite cow at the time and we learned the ropes together. She was always bull headed in the show ring but she loved cuddling when the show was over. Her first calf was a heifer calf but it was unfortunately born dead after trying to come out upside down with its head turned back. 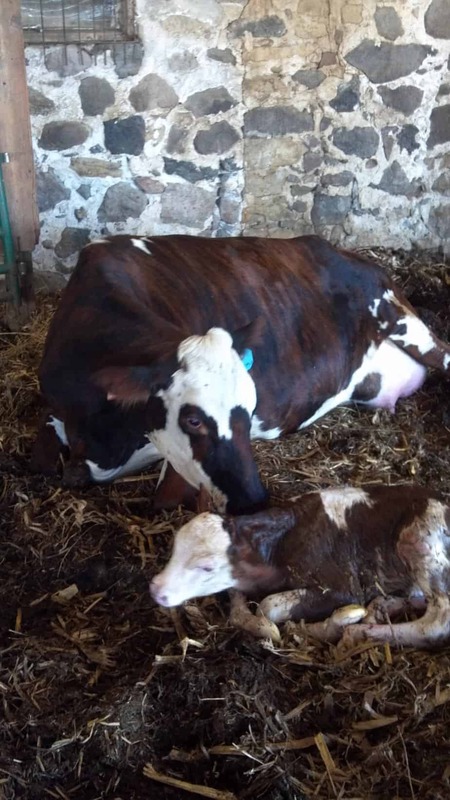 That was an agonozing delivery for me and her because I so wanted that heifer calf, but I couldn’t imagine loosing Ramona so we had made the decision for the vet to focus on saving the cow, whatever that took, which meant to c-section. Ramona recovered however she was a difficult breeder, just like your Norma. However we kept trying and finally she had another calf, of course it was a bull. 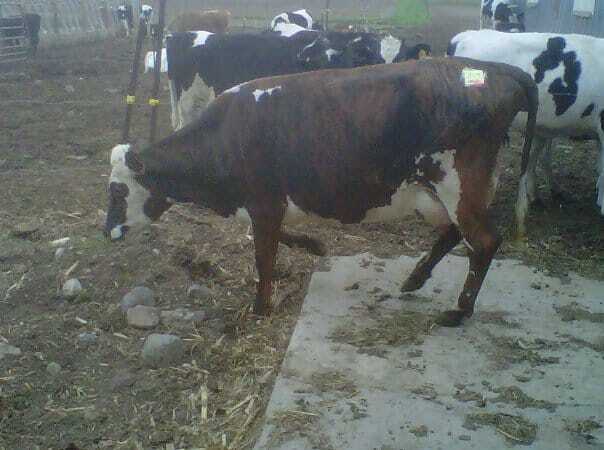 Again she was a difficult breeder and she ended up getting pregnant but loosing her calf. 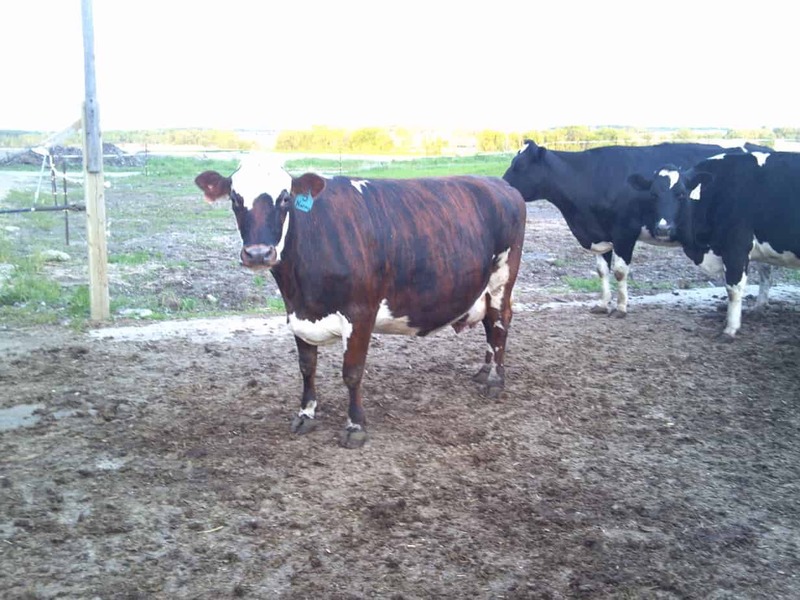 After that she got bred to the Holstein bull that was on the farm. At that point we moved our cows to another farm and she went to friends of ours where she would be out on pasture as a dry cow until she calved. One day she laid down under a shade tree and was unable to get back up. Unfortunately being in a large field by the time she was found it was too late. That was one of the worst phone calls I’ve ever gotten. I went to the farm to say good bye to her and they buried her for me where she would lie with the other special cows that had passed on before her. I still miss my Ramona girl who would be 7 years old now. I regret not having anything to carry on her bloodline but we had wonderful times together and that I will always remember. I’m sorry about your loss of Norma, but I want to wish you luck with your new calf Marylin. Thanks Abby for sharing your story. Cows can really be very special. I have to ask, was Ramona named after Ramona Beasly? Carrie – I didn’t see that Norma had died – I am so sorry, it was a terrible time for you. Thanks for sharing her beautiful story. I hope that her daughters will be ok. The new addition, who I know will not replace Norma in any way, is a very pretty heifer and I bet will give you lots of smiles to come. Your story reminded me of my father as a boy in Ireland (this was only the 1950’s not that long ago) his uncle had to bring the cow into the house to sit by the fire – she was ill, his only income, and he was desperate for her to get better, and of course, he loved her. Bessie was his special cow. feel better. You have a lot of friends around the farm and now around the world on facebook. Thank you Carrie for sharing your story. It brought me to tears because I know what it is to love our animal companions and lose them. You did all that you could and your story demonstrates how we farmers care for our animals. Your comment regarding the “family civil war” caught my eye also. My husband and I have been through that as well and even though the experience made us stronger and wiser, there are definitely emotional scars left behind. I’m glad you and your husband were able to move forward and have your own farm so that you could share your story about Norma and your farm story. The family complication can be a touchy subject but wondered if you have blogged about that before? I enjoy your blog and FB posts. Thank you Carrie – and may another special cow such as Norma cross your path again soon. I am brand new to this blog but have milked cows for 51 years, as of December 2014. I have similar and very recent experiences with bovine lieukosis and it is heart breaking to lose cows to that silent and vicious killer. I find that others carry it and only a few show the ultimate symptoms of death but we always wonder who will be next. I had several Once-in-a-lifetime cows, and my story started about 25 years ago.